Hey beautiful Highlites. It's been a minute since my last post. I have been so busy with life that I really haven't had time to post on my blog the way I would like. And I had kind of a rough few weeks, my diabetes has been running low because of my eating habits so that causes me to feel bad, not eating enough food for the amount of insulin I have to take. I had a reaction to a new medication and then I sunburned really bad and that had me in a fit. I can't remember ever being sunburned the way I was a few weeks ago. My skin was on fire and itching like crazy and it started to peel. I was like WTH? I wanted to jump out of my skin. So now I don't leave the house without my sunscreen. But back to me trying to balance my time, it's just not enough time in the day. Working a full time job, making sure my wifely duties are on point, being the best Nana, making sure to do my daily exercise, trying to stay in top of my health (and don't let me have to make a stop for anything on my way home!) — it feels like my evenings are gone before they even start. And when the weekend comes, I'm either hanging with the Mr. or trying to get some me time in with the girls. I received two or three planners for my birthday and Christmas, I had to pull them out to get some order in my life by prioritize my tasks. Planning to accomplish the most important or time-sensitive tasks first. I never thought I would be this busy with no children in the home just hubby and I, but it seems like I just don't have enough time. Preparation — make less decisions in "real time"
But the one thing that doesn't take a lot of time? Getting dressed in the mornings because I throw on one of my favorite trends. The wrap dress, like this one in the pictures above, is so easy. And the fit, the way it wraps the body, every Highlight should have one in her closet. 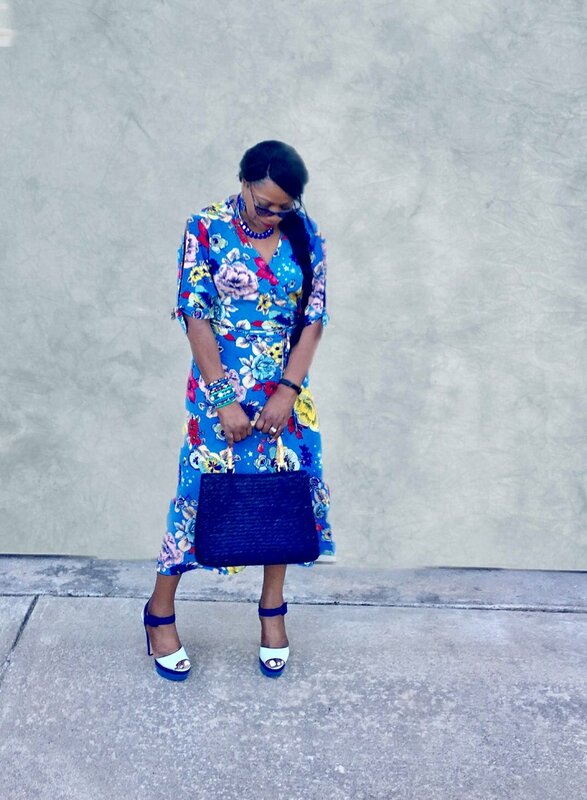 This dress was a gift to me for Mother's Day purchased @Rainbowshops under $20 and the platform sandals were out of my closet purchased a few years ago. Is anyone else had a hard managing their time? Let me know some tips that you may be saving a little of your time. Thanks for stopping by and sharing some of your time. See you next time.